Adobe InDesign provides professional layouts for print and digital publishing used amongst designers and graphics production artists. It is possible to conduct projects smoothly from design to print or digital output, thanks to tight integration with other Adobe solutions like Photoshop, Illustrator, Acrobat and Dreamweaver. This Adobe InDesign training course is ideal for those who wish to acquire the necessary skills to design and publish documents for print, online, or mobile devices. 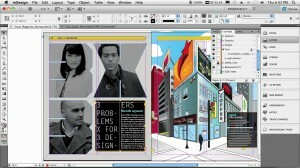 Adobe InDesign gives you the ability to create page layouts that are more complex and and interactive than those created with a word processing software. A course in Adobe InDesign will enable the students to effectively use the Adobe InDesign tools in order to create rich interactive documents, print more efficiently and build interactive presentations. This comprehensive training course enables the participants to know how to use the desktop publishing software InDesign or to improve their effectiveness. The students are therefore able to create high-end documents that meet the standards of the industry in addition to attract and fully engage the viewers.